An adventurous trip to the nomads of Central Mongolia and Altai Mountain Range, to discover their the way of life. Departure from Europe to Ulaanbaatar/Chinggis KhanAirport. In the morning arrival at Chinggis Khan Airport in Ulaanbaatar and transfer to the hotel. Short break after breakfast and start city tour including the Gandan Monastery and the National Museum. Visit the Choijin Lama Temple Museum after lunch and have dinner at the hotel. Today we will start our journey by jeep to the west to visit Kharkhorin, the ancient capital city of Mongolian Empire. Visit the Erdene Zuu Temple (World’s Heritage Site). In the evening, stay the night at the ger camp close to Orkhon River. In the morning, see Naadam Festival in the town (horse racing, wrestling and archery), one of the most exciting traditional holiday of nomads living in the Central Asia and celebrated from the ancient time such as Chingis Khans period. 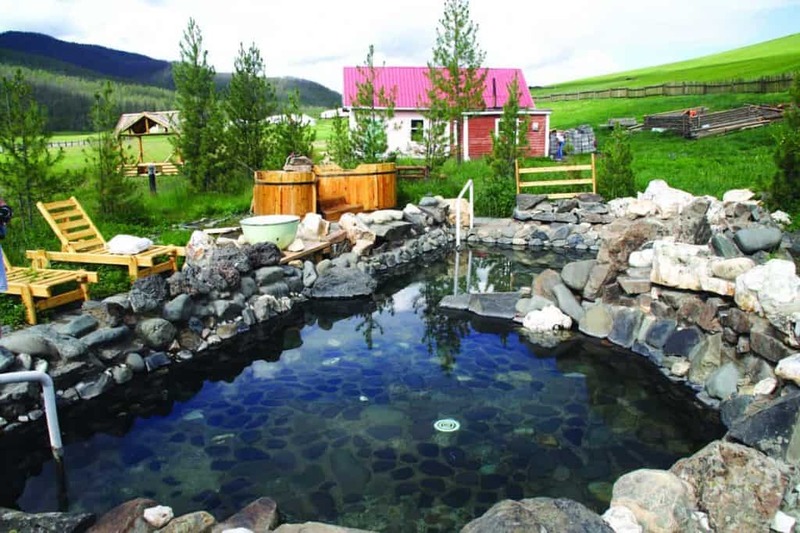 In the afternoon, continue our trip to the west for the hot spring of Tsenkher located in the wonderful valley of Khangai Nuruu National Park (named as Mongolian Switzerland). In the evening, taking a hot bath is possible and we stay the night at the ger camp. Trip to provincial town Tsetserleg (flower garden). Sightseeing of the fascinating temple museum Zaya Bandi and continue the journey to the stone Taikhar Chuluu close to the river Tamir. Stay the night at the ger camp. 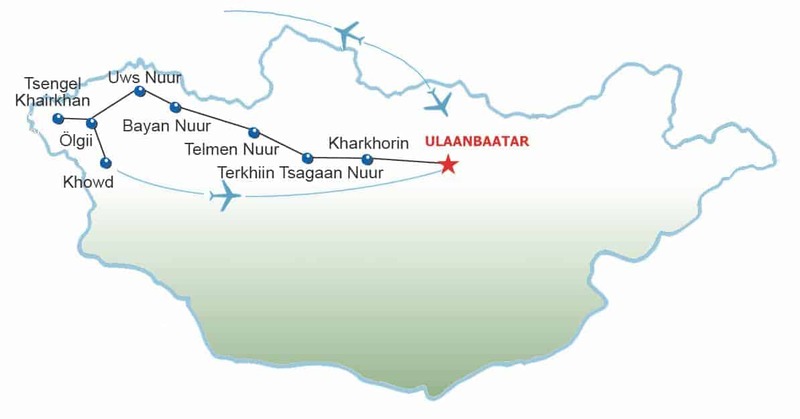 Carry on our trip to Terkhiin Tsagaan Nuur (Great White Lake) and visit volcanic crater Khorgo. Stay the night in the ger camp. Then, horse riding at the campsite is possible. In the morning, drive to the west to see the freshwater lake Telmen. 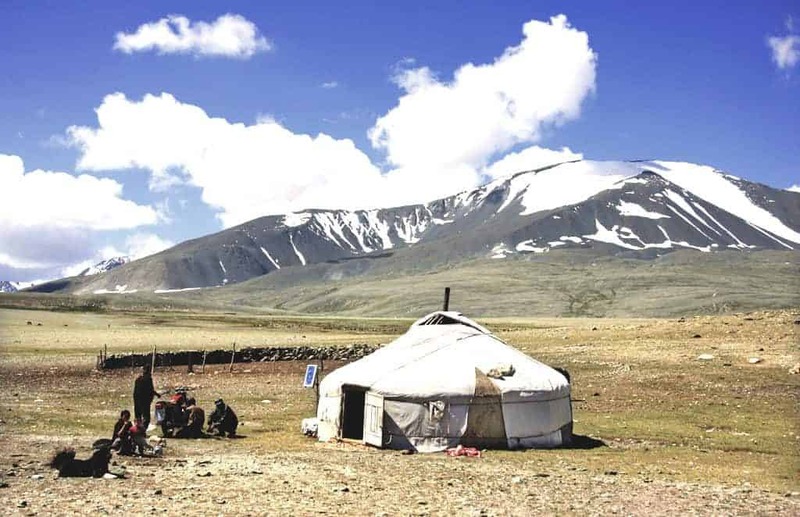 On the way there, we will enjoy wonderful landscape of Semi-Taiga Area, which is one of the parts of Khangai Mountain Range, and we will have the possibility to visit local nomad family. In the evening, we will have dinner at campfire and will stay the night in tent. Today we will continue our tour to the west in order to reach another saltwater lake, Khyrgas. The beautiful lake of Great Lakes Basin, ideal place for swimming and fishing. Stay the night in tent. In the morning, we will drive through provincial town Ulaangom to visit Turgen Mountain Nature Reserve and stay the night at the ger camp in the Valley of Turgen Mountain (3,965 m), by seeing the saltwater lake Uureg. Today we will drive to the western provincial town Ulgii, which is the homeland for different minorities such as Kazakhs and Tuvans (Mongolised Turk people). Stay the night in the ger camp close to town Ulgii. Drive to western side to visit the Tsengel Mountain and enjoy the lovely landscapes of Altai Range. 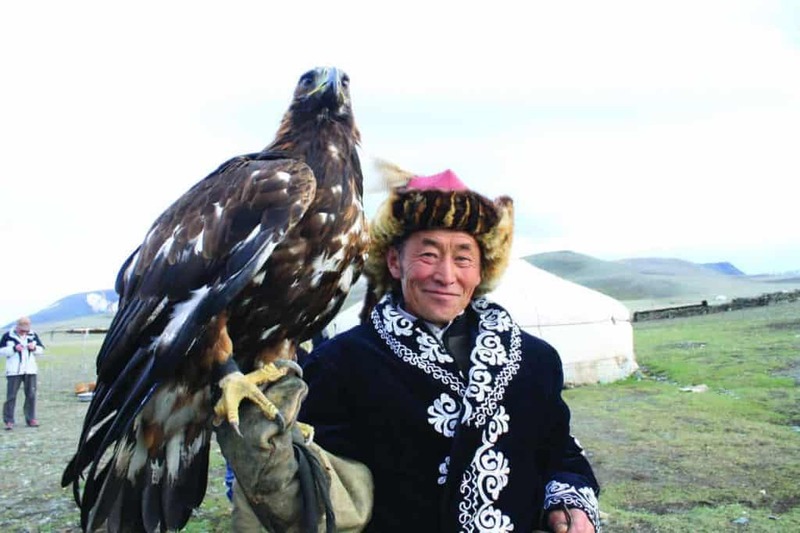 Stay the night in tent close to Kazakh families, famous for eagle hunting. Return to Ulgii and visit local Museum. Stay the night in the same ger camp as before. Today drive through beautiful freshwater lake Tolbo and third-highest mountain Tsambarav (4,202 m) before heading for the provincial town Khovd. Stay the night in ger camp close to airport. In the morning, visit a temple, at midday, three hour flight to Ulaanbaatar, after arriving, transfer to the hotel. Farewell dinner with folklore. Early in the morning, transfer to airport and departure.